There are over 200 types of mushrooms that have medicinal benefits. A common mushroom is the reishi mushroom, also known as the lingzhi mushroom. It looks like a large brown and white flower made of wood. It is one of the oldest mushrooms known to have been used for medicinal purposes. Mushrooms are the only fruit and vegetable that provides a source of Vitamin D. They are also packed with B vitamins, specifically Vitamin B2 (riboflavin) and Vitamin B3 (niacin), which will in turn speed up your metabolism. B vitamins are a key component for your body to turn food into fuel, which will produce energy. They also allow the body to metabolize fats and proteins. 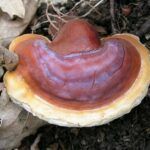 Reishi mushrooms are popular for treating inflammatory areas. This is because they contain Triturpiods. Triturpiods have a similar action of steroids. They have been seen to be beneficial for those with arthritis as well as asthma and chronic bronchitis. Ganoderic acid is also found in reishi mushrooms. This has been shown to reduce cholesterol and lower high blood pressure (hypertension). Ganoderic acid also has been shown to protect the liver against viruses and other toxic agents. The polysaccharides, terpenes, and other bioactive compounds in the fungus possess anti-tumor, anti-cancer, immunomodulatory and immunotherapeutic activites. It can cause dryness of the mouth, throat, and nasal area. It also can cause itchiness, upset stomach, nosebleeds, and blood stools. It can also trigger allergies. Also, reishi mushrooms have been shown to lower blood pressure so those with low blood pressure should avoid this mushroom. High doses of reishi mushroom consumption may increase the risk of bleeding with people who have thrombocytopenia. “Eight Types of Mushrooms and their Health Benefits”. N.p., n.d. Web. 18 June 2013. “Five Health Benefits of Mushrooms” best Health Magazine, March/April 2011. Web. 18 June 2013. “Lingzhi Mushroom” Wikipedia, n.d. Web. 18 June 2013. “Health Benefits of Mushrooms that You May Not Be Aware Of” 3/5/2008. Web. 18 June 2013. “Reishi Mushroom” WebMD, n.d. Web. 18 June 2013.